Amid a polarizing market, we are strengthening our business structure to meet the needs of each region. 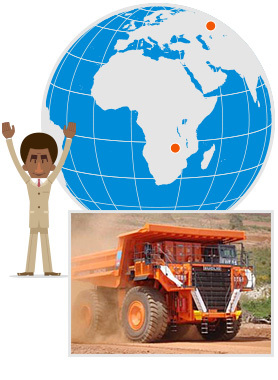 With their vast lands, great populations and rich underground resources, there is a strong need in emerging markets for construction machinery for the establishment of infrastructure and development of resources. 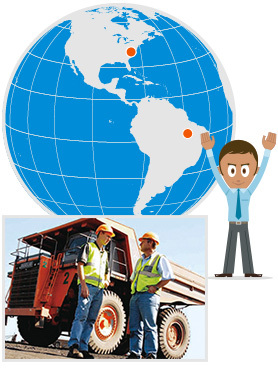 In these markets, machines are used in tough environments, such as operating for long periods of time in extreme worksites. So there is a demand for highly durable machines that do not break down easily, that can be repaired quickly if something does go wrong, and that are simple and highly cost-effective. Developed markets on the other hand seek machinery that complies with environmental regulations such as those for exhaust emissions, and that incorporates advanced features related to fuel efficiency and other areas. 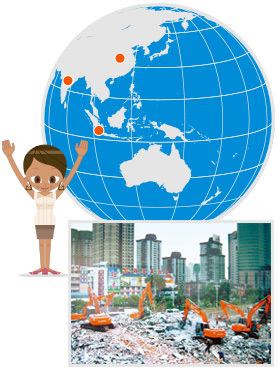 Amid such a polarizing construction machinery market, the Hitachi Construction Machinery Group will meet different customer needs in all countries and regions, through the supply of optimal products attuned to the respective region and by enhancing the solutions business such as services and financing. * The TATA Group is the largest industrial conglomerate in India, comprised of about 100 companies in sectors such as IT, automobiles, steel and food. * Deere & Company is the world’s largest manufacturer of agricultural machinery, selling such farm machines as the John Deere brand of tractors.